A mongrel killer-dog movie that takes us back to ‘Cujo’ territory, where Man’s Best Friend turns into his most ferocious enemy. Five college kids who are looking to party repair to an isolated house on a remote island, where flirty blonde babe Sara gets nipped by a cute puppy. She starts acting bitchy, but ‘expendable black guy’ Noah continues to drool over her. And this rabies scare is quickly forgotten when snippy brothers John (the jerk) and Matt (the swot) see a man ripped to shreds by ferocious German shepherd dogs. The pair even stop arguing over sporty Nikki (Michelle Rodriguez), John’s ex and Matt’s current girlfriend. The local guide-dog training facility, it seems, was nothing of the kind. Instead, the US Army was breeding genetically engineered attack dogs, which are now roaming the island, protecting their territory and, crucially, planning their manoeuvres with military skill. 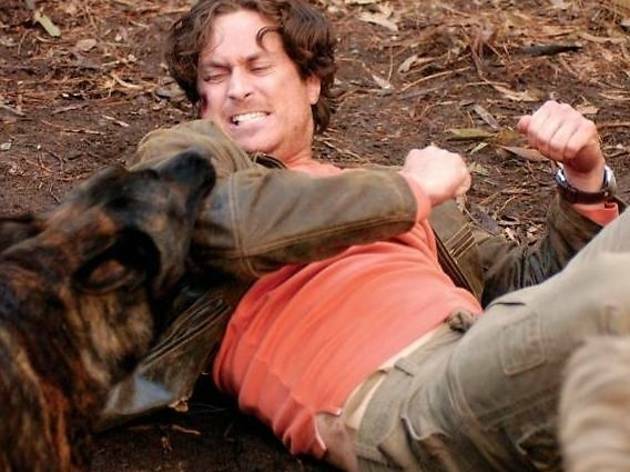 Director Nick Mastandrea and dog wrangler Sled Reynolds stage the gory canine carnage with skill and enthusiasm, while neglecting the humans in ways that would warrant a call to the RSPCA. Or would that be the NSPCC?